Thunderstorms forced the players off the course twice in the course of an action packed opening round that ended with Phil Mickelson leading in the clubhouse by two shots from Belgium’s Nicolas Colsaerts after a three under 67. England’s Luke Donald birdied short 11th, 12th and 13th to get to four under par when play was finally suspended for the day due to fading light with an erratic Mcllroy tied for 16th on level par despite finishing with a clumsy three-putt bogey at the 11th. A total of four hours and 15 minutes were lost to thunderstorms with the first delay of just over three and a half hours coming just after 8.35am at an old fashioned venue, softened by torrential rain, that was deemed too short and toothless for the modern player. Despite perfect conditiions that helped scoring late in the day, the old lady proved to have more than enough bite for most. The first weather delay didn’t appear to bother Mickelson too much as he scrambled his way to an impressive 67 featuring four birdies and one bogey to set the early pace. Meanwhile, 22-year old amateur Phelan carded a one over 71 that could have been several shots better had he matched his sensational play from tee to green with better putting. As Harrington birdied his final hole for a three over par 73, Phelan dropped two shots in his last six for a one over par effort that left him provisionally tied for 35th with 78 players set to return to the course this morning to complete their second rounds. “I wasn’t thinking about that,” Phelan said when asked about the birdie putt he had for a share of the lead just six holes into his round. “I was just trying to hole the putts. Rory McIlroy plays his third shot on the second hole during the first round at the 2013 U.S. Open at Merion Golf Club in Ardmore, Pa. on Thursday, June 13, 2013. (Copyright USGA/Darren Carroll)However, he three-putted the fifth from just off the green and then dropped another shot when he flew the green at the 236-yard, par-three ninth. A Sectional Qualifier, US-based Phelan hit 12 of 14 fairways and 16 of 18 greens in a magnificent display of ball-striking that bodes well for his appearance in the Irish Open at Carton House and his chances of a Walker Cup call up later this year. And he was more than pleased with his 71 despite taking 33 putts, explaining that he learned a lot from his experience in the 2010 US Open at Pebble Beach, where he got too aggressive and shot rounds of 83 and 75 to miss the cut. “I learned more in that week than the rest of my golfing career combined,” said Irish international Phelan, who lived in Waterford from the ages of three to nine before his family emigrated to Florida. “It was a huge help today when I just wanted to stay patient. “When I made a couple of mistakes, my experience of Pebble served me well. I went back to the patience. Last week was a tough week as well, playing match play against the Americans in the Palmer Cup. It was a good standard of golf. Rory McIlroy plays out of the greenside bunker on the third hole during the first round at the 2013 U.S. Open at Merion Golf Club in Ardmore, Pa. on Thursday, June 13, 2013. (Copyright USGA/Darren Carroll)“I’m not really thinking about making the cut, I’m just thinking about hitting each shot as it comes. That was my only goal this week. “It’s not easy but I think I’m doing a good job so far. It’s always nice to be able to compare yourself to the best in the world. World number one Woods was two over par and facing a short par putt on the 11th after an erratic display on the greens in the marquee three-ball alongside McIlroy and Masters champion Adam Scott. Out of sorts with his wedges and his putter, McIlroy opted to putt out after the hooter sounded in fading light but three-putted the 11th to slip back to tied 16th on level par as Scott made birdie to join Mickelson on three under. Pre-tournament favourite McDowell endured a tough day with a double bogey seven at the second and a bogey at the third leaving him three over after just three holes. He hit back with birdies at the eighth and ninth but then overshot the tricky 11th and made a double bogey six before leaving the course on three over par with six holes to complete this morning. 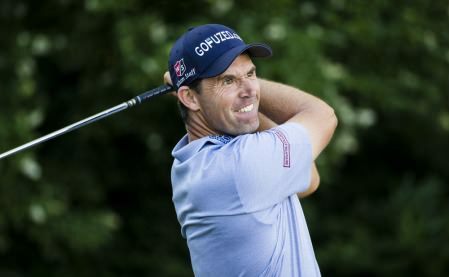 Harrington was disappointed to bogey the 103-yard 13th and the eighth with just a wedge in hand but pleased to limit the damage to a three over 73 having soared to four over through just eight holes following a double bogey five at the 17th and a bogey at the 18th. Padraig Harrington plays his tee shot on the fifth hole during the first round at the 2013 U.S. Open at Merion Golf Club in Ardmore, Pa. on Thursday, June 13, 2013. (Copyright USGA/Darren Carroll)“Two bad wedge shots on probably the two easiest holes on the course, cost me those two bogeys on 13 and 8. I’m disappointed with those. Besides that the rest of the day was pretty solid. “There’s opportunities for birdies on some of the shorter holes but plenty of tough holes too and if you’re four over you’re thinking I’ve got to play the tough holes really well and I have got to play the easy holes super. “So I did put myself in really difficult place. As I said, disappointed with eight, simple wedge in there, if I make birdie one over wouldn’t be so bad. Darren Clarke was five over par through 14 holes with four bogeys and a triple bogey seven at the 12th erasing birdies at the 11th and par-three 13th. Phil Mickelson during the first round at the 2013 U.S. Open at Merion Golf Club in Ardmore, Pa. on Thursday, June 13, 2013. 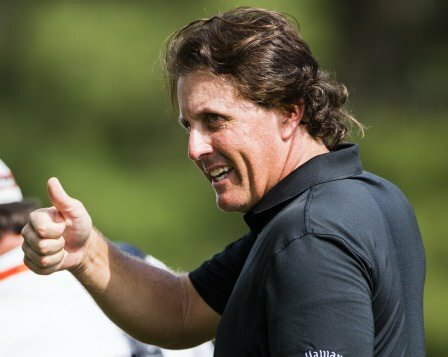 (Copyright USGA/Michael Cohen)They said it would be a massacre of Merion but the grand old lady of American golf proved more than a match for the game’s elite as only Phil Mickelson managed to lay a glove on her in the early stages of the weather-delayed US Open. 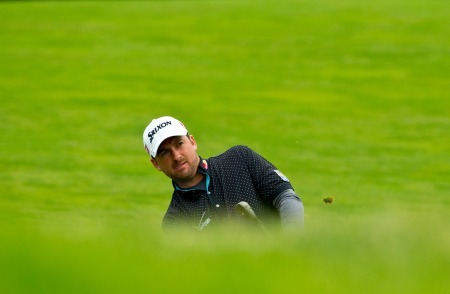 Graeme McDowell plays his third shot on the 18th hole during the first round at the 2013 U.S. Open at Merion Golf Club in Ardmore, Pa. on Friday, June 14, 2013. (Copyright USGA/Steve Gibbons) We probably should have noted the warning signs last Tuesday. Graeme McDowell, one of the hot favourites behind Tiger Woods to win his second US Open this week, hemmed and hawed about the conditions, about possible mud balls and even about being heavily tipped. Rory McIlroy plays his tee shot on the 11th hole during the second round at the 2013 U.S. Open at Merion Golf Club in Ardmore, Pa. on Friday, June 14, 2013. (Copyright USGA/Darren Carroll)Rory McIlroy and Tiger Woods ducked and weaved as best they could but tough gal Merion continued to land her punches in what’s turning out to be a fascinating US Open. Padraig Harrington plays his tee shot on the 10th hole during the second round at the 2013 U.S. Open at Merion Golf Club in Ardmore, Pa. on Friday, June 14, 2013. (Copyright USGA/Michael Cohen) Pádraig Harrington putting woes continue to haunt him. Phil Mickelson plays his tee shot on the fourth hole during the third round at the 2013 U.S. Open at Merion Golf Club in Ardmore, Pa. on Saturday, June 15, 2013. 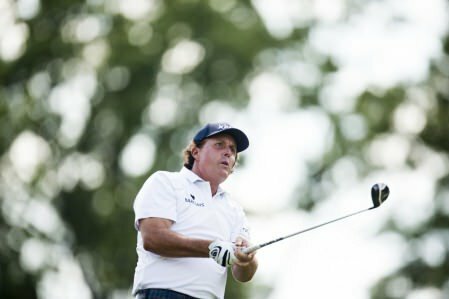 (Copyright USGA/Joel Kowsky) Phil Mickelson is on track to end a lifetime of heartbreak in the US Open after a battling 70 gave a one stroke lead heading into the final round on his 43rd birthday.